I love trying new beauty & skincare products and I’ve honestly been obsessed since my early teens. Partly, because my mom was a model and I grew up surrounded by the beauty & fashion industry, but also because she took absolutely immaculate care of her skin. To this day, even though she’s in her 60’s, she barely has more than a few fine lines. Definitely huge inspiration! With that said, I’ve had the pleasure of attending several wonderful PR events this past month and I’ve loved receiving and trying new products. So today I’m popping in to share those with you. First up? I’m so excited and impressed with Veriphy Skincare. This all Canadian, cruelty free and 98% natural line has become a favourite part of my beauty routine. I’ve noticed improved skin texture, reduced redness and an overall improved quality to my skin. I’m currently using their moisturizer, facial serum and eye cream. All of their products harness the power of phytoglycogen which is found naturally in the body and skin, giving your skin the energy to produce collagen, elastin and hyaluronic acid, as well as fuel skin cells to revitalize and rejuvenate, naturally. Charlotte Tilbury. Oh my gosh, clearly I’ve been living under a rock. This is my first time trying Charlotte Tilbury and I can safely say I’m a forever convert. All of the products I’ve tried have been absolutely amazing. A few of my current favourites are: Scent Of A Dream (a beautiful blend of lemon, peach, black pepper, saffron, mandarin and bergamot), The Pretty Glowing Kit (which is a blend of blush and a gorgeous shimmering highlighter) and last but not least, love love the Hot Lips lipstick. Also, next on my “to try” list is the Hollywood Flawless Filter, an amazing complexion booster which primes, highlights and covers your skin giving you the look of your favourite digital filter. And excited to try the Genius Magic Powder, a light diffusing loose powder which I’m SO in the market for. EOS. I’ve been using their lip balm and shave cream religiously for a couple of years and I can’t imagine my life without them. 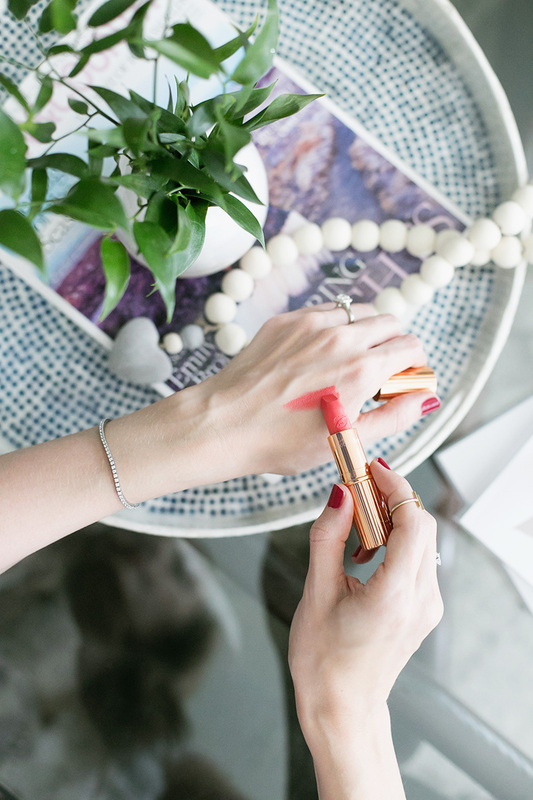 Plus, I love the look of their lip balms… I have one in my bathroom, purse and car. Clearly, I’m addicted. And if you’re looking for the perfect stocking stuffer? EOS has an adorable 3 pack tin which includes their Fireside Chai, First Snow and Raspberry lip-balms. I recently previewed them all at the Faulhaber event and they’re amazingly delicious + made from carefully crafted ingredients. Available at Shopper Drug Mart, Rexall, London Drugs.